The A992 is identical to the A991, except the lacquered bronze provides a beautiful look and rich, deep, mellow tone.With resonance and a refined sound the 992 series has outstanding evenness of intonation over its entire range at all dynamic levels. The 992 series has various upgrades over the 902 series: The double arm support on the low keys ensures better pad seating and a stronger low end sound. The posts that hold the keys in place are mounted onto strong support straps that run the length of the instrument; this adds weight and support to the body and influences the carrying power of the tone. Also the 992 series has an underslung neck for less resistance in the response and more reliable mechanics. eflon octave system - Both ends of the octave key axis rotate in a receptacle that is coated with Teflon to ensure a smooth operation every time. Rocking table mechanism - The C# and Bb keys have a rocking table mechanism that allows for optimal speed and fludity. Double connected table key - Not only are the C# and Bb keys connected with the oscillating table mechanism, but the C# and B have also adopted this same motion. F-auxiliary key mechanism - Ensures a proper seal of the pads when playing in the low range of the saxophone. "Indented" white shell keys provide comfort for the player. 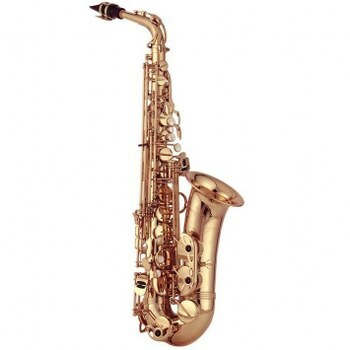 Ribbed construction - The posts are connected to a single metal rib that is soldered to the body of the saxophone - adding durablility and longevity to the horn. Metal thumb rests - Both thumb rests are metal to match with the style of the horn. The right hand thumb hook is adjustable. The pivot screws are pointed to allow an accurate center and precise action. The pads are air-tight and waterproof to extend their life. Blue steel springs provide a quick response and greater durability than stainless steel. Double braced arm - Two separate arms connect to the pad cup to ensure proper seating of the pad and improve the durability of the instrument. The tri-point balanced bell brace firmly connects the bell and the body of the horn. Hand made in Japan. Hand Engraved. Lacquered bronze. High F# key. Comes with woodshell case with quality ebonite mouthpiece.